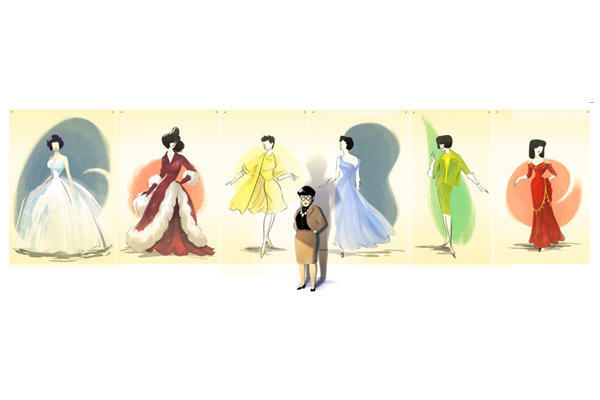 I’m not sure there’s any higher honor these days than getting a Google doodle — and legendary Hollywood costumer Edith Head, who’d be 116 today if she were still around, got hers today. It’s one of my favorites of all time, visually, with tiny sketches of her most iconic work in films like Sabrina and The Birds. (That understatedly stylish figure in front of them is Head, who had her own signature look.) She’s close to my heart for her work on one of my favorite films of all time, Breakfast at Tiffany’s, which makes her the de facto designer of the Halloween costume I’ve worn several times. She also holds the record for most Oscars won by a woman. Costume design, of course, was a refuge for many women who wanted to work behind the scenes but found that even the world of set design was impossibly sexist. (Still, costume design had a gendered hierarchy, however, as well, making it difficult for women to rise through the union ranks until the ’70s, a barrier Mary Tyler Moore Show costumer Leslie Hall helped break.) Congrats, Ms. Head — thousands of women will be classing up Halloween parties this week with little black dresses and rhinestone tiaras because of you. MARY AND LOU AND RHODA AND TED: Now Out in Paperback!